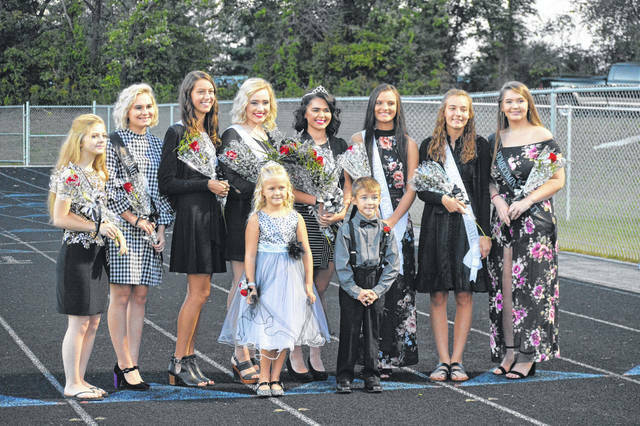 River Valley High School Raiders chose their Homecoming Queen, Friday Night. Little Miss River Valley Lydia Green and Little Mister River Valley Bryson Edwards stand in front. From left to right are Freshman Representative Isabella Dobbins, Junior Representative Evalena Ehman, Queen Candidate Josie Jones, Queen Candidate Morgan Johnson, RVHS Homecoming Queen 2018 Adi Fox, Queen Candidate Madisyn Burd, Queen Candidate Julia Nutter and Sophomore Representative Adrienne Burd.